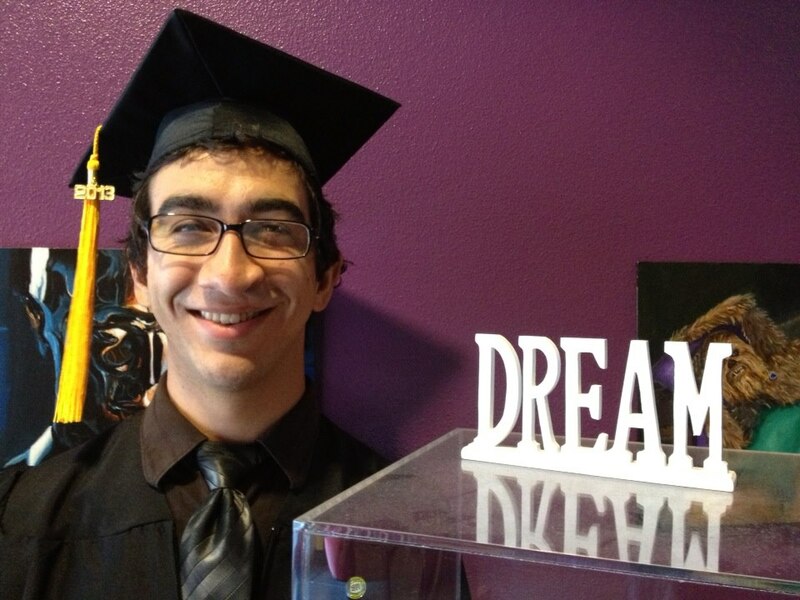 On August 8, 2013, my son Conrad graduated from Ex’pression College in Emeryville, California, with a BS in Sound Arts. As Salutatorian of his class he had to give a speech. For Conrad, public speaking is not one of his favorite activities, but we all thought he did a wonderful job! Only three weeks out and I’ve already picked up scratches, bruises and a broken finger… it’s a cruel world out there guys. What do you think dad? Another two and a half years? You guys have a spot for me right? For those of you who know me, you know I’m no good at this whole talking business, so bear with me and I’ll try my best. If you need to use the restroom, now would be the time. The only words that come to mind are thank you. There’s no other way to sum up three years than to say thank you. Every memory that I have of this place will be of you guys. When we first stepped through those doors, all doe eyed and drooling, we were, at least I was, stupefied. Everything from the funky colored walls, to the mothership we call the 9K, to Meyer Hall… a dark place where dreams go to die and the most candid and exuberant Egyptian Teddy Bear lives to make you laugh and cry at the same time. It all dazed me and sucked me in. I stormed in here with puffed up ambition and a head full of ideas, got involved with all sorts of projects… made all sorts of promises. But, all that was just the vehicle. It’s you… you made the trip mean something and for that I can only say thank you. Heidi, I didn’t really know Ex’pression until I got to know you. You are so much a part of the soul of this place and so much a part of why I fell in love with it. The conversations we’ve had, books and movies we’ve shared, are the reasons why I had a place to go even when I had no reason to be at school. So thank you. Dave Earnst, if you’re here I want to thank you too. In the midst of all the technical jargon, trade secrets, engineering tricks and toys, your voice came through clear and resounding, reminding me not only of my passion for music but also the reason why I do it. Mom and Dad. Only you know where I was before I first set foot in this place and the process we went through to get here; the unbelievable and undeserved grace that let me stand up here with my friends today. It’s hard for me to even imagine who I’d be if it weren’t for your love and support that summer. Take that and apply it to my entire life and I’m overwhelmed with admiration. You two are the most amazing parents and I love you. A salutatorian speech… yeah I had to look it up… is supposed to look onward and upward. But I want to ask you to join me in looking back, to before we even set foot through that door for the first time. Try to remember exactly what you felt when you made up your mind that Ex’pression was to be your home for the next three years, what kind of dreams and ambitions you had – not knowing what you know now. Find that energy and passion and put that back into the next few weeks and months to come. Do that and I think we nailed exactly what Jack Douglas told us a few weeks ago, that we’re one of the best graduating classes he’s seen yet.